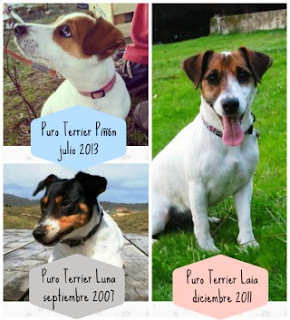 Jack Russell - Puro Terrier: Wet adventure! As today was a wet day, we leave you with a video of Luna, Herba and his fellow adventurers Ron and Bob, through little rivers in their Sunday stroll through the woods. We can not miss the opportunity to mention that Luna, who for months for this river would be an insurmountable obstacle, today she has crossed it splashing like a champion. Como hoy ha sido un día pasado por agua, os dejamos con un vídeo de Luna, Herba y sus compañeros de aventuras Ron y Bob, atravesando riachuelos en su paseo dominguero por el monte. No podemos dejar pasar la ocasión de comentar que Luna, para la que hace meses este riachuelo sería un obstáculo insalvable, hoy lo ha atravesado chapoteando como una campeona.